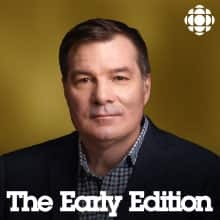 CBC Radio One's The Early Edition podcast features the top story of the day. Expect to hear highlights from the show's news, health, civic affairs, cultural and community coverage. Not many people know about the land the Squamish Nation is developing on. It's on an ancient village called Sen?á?w and the Squamish people were forcibly removed from it in 1913. Marketplace, Safe 3rd Country Rethink, Flood Factoid, On the Ledge, Eli Glasner, Jody Wilson-Raybould, Open Line and Gerald Baier, Jonathan Wilkinson. Cellphone Coverage, Cancer Virtual Reality, Ottawa Report, Entometriosis, Go Public, Jonathan Wilkinson on SNC-Lavalin Latest, Huawei and Security, Still Standing, Esplanade Closing. Cost of Kids, Jody Wilson-Raybould, Dr. Tepper in for Dr. Lin, Summer Jobs, More on Jody Wilson-Raybould, Yet More on Jody Wilson-Raybould, Carbon Tax, Even yet more on Jody Wilson-Raybould, Metro Matters, and Peter Ladner on the 10-year anniversary of the death of Wendy Ladner-Beaudry. We ask a women who went through renovictions what would help people fight back. You can find Sam McCullough driving a fuel truck from 5 pm to 5 am. He hauls nearly 20 thousand litres of diesel around to give trucks a refill. Producer Jake Costello jumped in for a tour of his shift. CBC radio producer Matt Humphery brings us this story about a natural underdog. Our political commentators Moe Sihota, Amy Robichaud and Nicola Spurling debate a public inquiry into money laundering and the Alberta election. The Early Edition's Jake Costello spent a week tracking down the city's graveyard workforce. And in this first installment, he finds that life isn't always gravy on the night shift. Liberals and Millenials, World Figure Skating Championships, Dr. Lin, Wildfire Season, Shark Fin Ban, Joyce Murray, Spring Thing, Money Laundering, Nowruz, Distracted Driving Rules, and Metro Matters. Snowplow Parenting, Skills Retraining, Drought Watch, Mount St. Helens, Anti-Gang Program, China Family Planning, Budget Housing, Young Muslims, Glen Hansman, Winter Wrap-Up. Marketplace, Junos Preview, Christchurch Terror Attacks, Short-term rental crackdown, Climate Strike and Islamophobia. Part of the Early Edition's Still Standing series: If you have a Steinway or Bechstein that doesn't sound like it used to - Story and Company Pianos can fix it for you. Flying reality check, Bobcat, Disposable chopsticks, Port Alberni, Ottawa report, India gate, Indigenous guardians, School dress code, Surrey farm, Measles vaccine, UN on plane crash, Story pianos, Boyd on flights, Romeo Dallaire on gambling. Justin Trudeau Responds to the SNC-Lavalin Affair, Teresa Wright on Trudeau's Comments, Plus-14 Doc, British Home Children, NPR on Huawei, Young Liberals, Terry Teegee on SNC-Lavalin, Kindness of Strangers, Metro Matters and Elizabeth May on SNC-Lavalin. Butts Testimony, AIDS Breakthrough, Dr. Lin, Misinformation, Secret Marathon, Butts Testimony LIVE and Reaction. Fats, The Life of Skanda Navaratnam, Ottawa Report, Youth and Climate Change, Online STI Tests, Jagmeet Singh, Vancouver Tenants Union and Affordable Rent, Still Standing, Jody Wilson-Raybould to Testify. and Vancouver's Birthday. Marketplace, ICYMI: Angie Thomas, Delta officer stabbing update, Gwendolyn Brooks, Mandatory Vaccinations in New Brunswick, Oscar Campaigning, NEB ruling and minister Jonathan Wilkinson, Fountain Chapel, Cochrane on the latest in the SNC-Lavalin story, Mohawk Ironworkers Dance, and Car Break-and-Enters on the rise. Castor Semenya and Testosterone in Women Sports, Misleading Telecoms, Salmon Expedition, Why some Canadians won't listen to Vaccine Science, Michelle Buteau in Vancouver, Vancouver Dad on BC Budget, Mission Boxing Club, Student Loans Relief, Second Plecas Report and Angie Thomas in Vancouver. Codeine and Cough Syrup, Gerald Butts resignation, Edibles and Health, Air b'N'b follow, How to talk about Measles, Reconcile This, Carole James on B.C. budget, Metro Matters and Wildfires and the provincial budget. State of the Union,Third Pole Melting, Dr. Lin, Wildfire Smoke, Women and Brewing, Cryptocurrency Panel, Red Envelope Cake, Landlords on New West's renoviction rules, Sun and Buns, Metro Matters, and Railway Safety. China/U.S. trade relations, Chambers on Manhood Ads, Terfry on the Mommas and the Pappas, Teen Sleep Solutions, Dr. Lin, Crackdown, Huawei, Cocoa Sustainability, Nanaimo Byelection Day, Weather Gloating, Manthrope on China, Lummi Whales, Metro Matters and Fallen Crane.